ADT/Protection 1 has won a wrongful death court case in which it was sued by the estate of a deceased customer. However, the attorney for the deceased customer's family tells IPVM this is not the end of the litigation. In November 2018, US District Court, Kansas dismissed a wrongful death lawsuit comprising 7 complaints against ADT/Protection 1. The suit was filed on behalf of Frost's young son, 4-years-old at the time of her death by an August 15, 2016 fire in her Topeka, Kansas home. The Plaintiff says the Defendant failed in its duties to Frost. However, the court granted the Defendant's motion to dismiss on all 7 counts. While ADT declined to comment, IPVM spoke with the attorneys for the Plaintiff, an independent legal expert, and several central stations. Should ADT have been responsible for responding to those signals? Multiple central stations say no but some say yes. Did the customer have a fire monitoring contract? New Plaintiff information says yes but the system at the time of the fire, did not have it active, and the customer had moved in between. What responsibility, legally, ethically or reputationally does ADT or other monitoring companies have when tragedies like this happen? While the newscaster said ADT "received numerous alarms about the fire," there were only two signals received by ADT during the fire. One was a tamper alarm and the other was a supervisory signal. Neither signal was "about the fire," as this was a security-only system. The 7 counts brought against ADT/Protection 1 included wrongful death, Kansas Consumer Protection Act (KCPA) Violation Deceptive act and/or practices, as well as breach of implied and express warranties. 2:04 AM—Defendant "Full Clears" all signals from the Frost residence, meaning no further action will be taken and the signals and call attempts will be logged in the audit trail. 3:07 AM—First responders find Frost facedown and unconscious on the hallway floor. 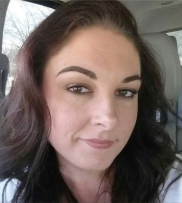 They remove her and begin emergency medical treatment while en route to Stormont Vail Health Care In Topeka where she succumbs to her injuries and dies. On Count 1, Wrongful Death, the Plaintiff claims that ADT/Protection 1 had a duty and an obligation to notify authorities on alarms if the homeowner was unreachable. They did not do so. The Plaintiff maintains that since Frost was still alive even an hour and a half after the first signal was sent to the Defendant, she may have lived had police been sent to investigate the tamper alarm on the Glass Break Sensor at 1:30 AM. [They] called using an unlisted number, during election season, in a state in which residents are inundated with political robocalls from unlisted numbers. While Ms. Frost was likely incapacitated due to smoke inhalation by the time Protection One got around to calling her house, her grandmother thought the calls to her were political robocalls and didn’t answer. 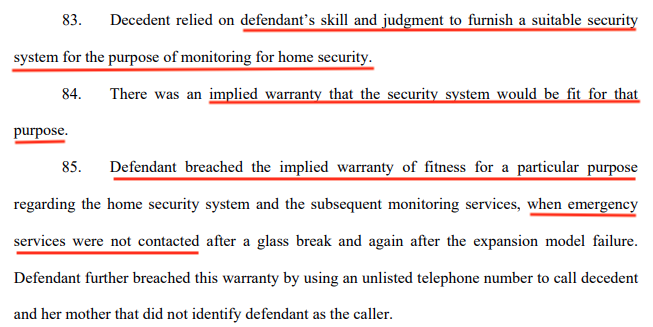 The Defendant was unable to notify the homeowner on the alarm, so per their own advertised protocol, the Plaintiff asserts, ADT should have dispatched police. The damages the Plaintiff sought were unspecified on Count 3. Furthermore, Count 4 claims that because the Defendant's offered monitoring service was "useless" during the fire that killed Frost, it was useless during the life of the Defendant's contract with the decedent. Based on this, the Plaintiff sought specified damages of $10,000/day for every day the contract was in effect, a period based on documents provided to IPVM by the Plaintiff of at least 5 years. This leads to a likely damages ask for Count 4 of at least $18.25 million. Damages sought for counts 6 & 7 were unspecified. 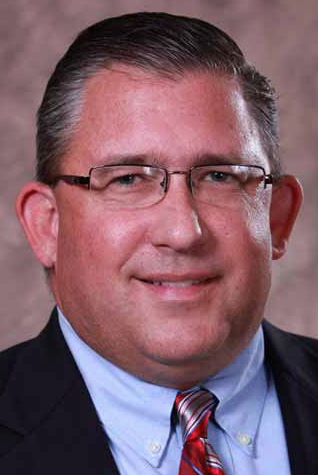 IPVM spoke with Randy Rhodes of Rouse Frets White Goss Gentile Rhodes, P.C. Unsophisticated people sign ADT’s ridiculously one-sided, adhesion contract, not realizing that they are relinquishing their rights to seek redress in court if and when ADT fails to perform under the contract. ADT even sneaks in a short statute of limitation that no reasonable consumer will understand. These types of business practices are unconscionable, in my opinion. ADT really knocked this case right out of the park. Of course we don't celebrate the unfortunate circumstances that gave rise to the case, a residential fire resulting in death, but many legal issues were addressed... Giving credit where credit is due, I have to assume that ADT defense counsel clearly laid out the defense. The alarm industry needs to insulate itself from claims arising as a result of alarm equipment or alarm service failure because the losses and exposure is disproportionate to the compensation paid to the alarm company. That is the accepted rationale and it has been repeated and approved consistently in courts throughout the United States and elsewhere. According to the contract and policy, ADT should have called the police when it was unable to verify the alarm. ADT initially said it would consult with its legal department and speak with us, but did not respond to repeated requests for an interview. My understanding is that they received a contact id event E383 Sensor Tamper. This is classified under Sensor Trouble conditions for burglary alarm devices. The proper response for any E3XX code is to notify someone about a maintenance or repair problem. If the industry sent the PD to every unresolved E200-E300 range of events we would bury every law enforcement agency with false alarms in a few hours. Other central stations who wished to remain anonymous agreed that the correct protocol on both signals received was to notify the customer, but not dispatch. The Frost case is far from over. We respectfully believe the district court judge erred in dismissing the claims against ADT and we intend to appeal that decision to the Tenth Circuit Court of Appeals. Per Frost's Alarm Services Agreement dated March of 2014, she did not elect fire alarm protection. At the time of the fire, she only had a burglar alarm system that is not designed nor UL-listed for detecting and signaling central stations of a fire. There was supposed to be a fire alarm included with Ms. Frost’s services. When she moved and transferred her service to her new home, Protection One failed to make sure the smoke alarms were moved and were operational. It seems to me that if someone has contracted for something and is being charged for that service, the equipment ought to work as promised. These documents are definitely at odds with the 2014 Alarm Services Agreement supplied by the Defendant who makes no mention of Frost's status as a customer prior to 2014. Certainly, when ADT and other monitoring companies help save lives with quick response and intervention it should be celebrated. However, when customers die, despite signals being sent to the monitoring company and potentially a fire alarm contract being in place, what responsibility should the monitoring company have? For the Plaintiff attorney's part, he explained to IPVM that "No condolences have been extended by ADT," and that "We are not aware that ADT intends to undertake any remedial action to prevent a situation like this from happening in the future." Of course, ADT is likely limited by concerns of the ongoing litigation. If ADT does take any action, we will update this report accordingly.